LEAVING THE ISLAND: The Oscar-nominated 'Sun Come Up' follows the struggles of the first climate-change refugees. Jennifer Redfearn's documentary Sun Come Up opens with Eden-like scenes of island life: kids climbing posts and leaping into the ocean, contented locals feasting on fresh-caught fish and coconuts, families singing and dancing together. "We are an island community," says Ursula Rakova, a young woman whose home is the Carteret Islands. "We have lived here for thousands of years. This is a way of life for us." But this paradise off the coast of Papua New Guinea won't last much longer. The Carteret islanders are among the planet's first global-warming refugees. As seas have risen, saltwater has polluted their freshwater wells, inundated their fields and washed away some of their houses. The 2,500 residents of the Carteret Islands are seeing their home slowly erode into the sea. Yet the islanders aren't fatalistic or angry. They mount a mission, sending some of their young leaders to Bougainville, an autonomous region of Papua New Guinea about 50 miles from their home. 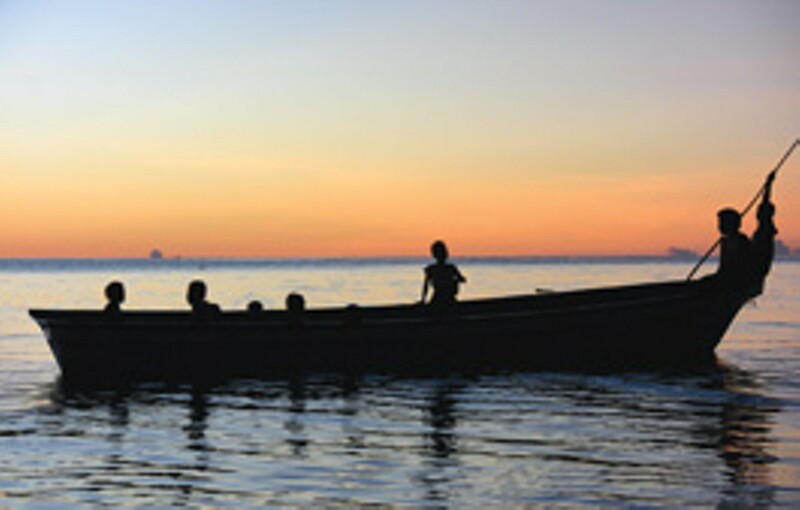 The Carteret islanders go on a three-week, 15-village tour in Bougainville, seeking permission to relocate some of their people in each village. It's a taut and well-told story, culminating in an ending so poignant that viewers will want to spread the word. The Academy Award judges felt the same way, this year nominating Sun Come Up for best Documentary (Short Subject). The film is one of 58 screening at the fourth annual Sebastopol Documentary Film Festival, slated for March 18-20. Each documentary will show just once, with the exception of award winners and whichever film is most popular. That film could well be Sun Come Up. "I wanted to tell this story because it's not an outside organization [coming in to relocate the Carteret islanders], but local people taking matters into their own hands," said Redfearn, the film's producer. "They understand local politics, land ownership and local initiative. The land is intimately connected to people's identity—they describe the land as their bones—it's their history, ancestry, culture and communal ties." Redfearn notes that by the middle of this century, projections say there will be between 50 million to 250 million climate-change refugees. Sun Comes Up shows how hard it is to resettle a relatively small number of people, giving viewers a sense of the task ahead. But the success of the film lies not in facts or figures, but in the human story. In one of the film's most heartrending scenes, an islander realizes that to survive they'll have to integrate. "We will no longer be Carteret," he says. "We are now Bougainville." Among the other highlights of the festival is a closing-night blowout: Coals to Newcastle, the saga of a funk band from Leeds bringing their sound to New Orleans, followed by a live performance by that very band, the New Mastersounds. "Nobody's seen these films, that's what makes it so exciting," says Jason Perdue, program director. "In the film festival world it's important to have the newest docs." Also worth catching will be the 40th anniversary of New Day Films, a collective of independent filmmakers who formed to distribute films no one else would touch. Screening March 19 will be Jim Klein's 1976 Oscar-nominated documentary Union Maids, about three women who were organizers of the first industrial unions in America. They'll also show clips from some of the most memorable films produced by New Day during the past four decades. New Day, which meets annually at Westerbeke Ranch near Sonoma, now has more than a hundred filmmaker members. Klein cites New Day as the forerunner of DIY documentary filmmaking that's become standard today. "We were seeking an alternate means of getting information to people, not mass media," he said. "Now [via the internet] we have it."